The Hunza Living-Energy Water Systems re-oxygenate the water giving it more life-force energy to benefit all living organisms, and seems to bind heavy metals and other substances such as chlorine so that they do not build up either in your pipes or in your body. The Hunza utilizes one of nature's hidden secrets. It is not magnetic and it's energy has no polarity. The device alters the atoms of the water pipe and hot water tank along with the water passing through. By attaching one to the outside pipe of your incoming water supply and one on top or next to your hot water system, you will (within 2 or 3 days) have delicious, energized water that is alive with energy and free of odor and chlorine. This is a device that requires no chemicals, electrical power or maintenance and will last indefinitely. Most water softeners exchange sodium salts for the less-soluble calcium salts present in the water. However, sodium salts are not beneficial to health, especially where heart and cardiovascular problems are concerned. The Hunza Living-Energy Water Softener relies on an ionizing action claimed to diminish objectionable odors and tastes, meanwhile retaining natural minerals for healthier consumption. 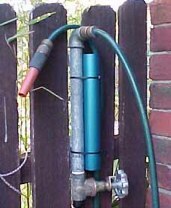 No need to cut pipes or disturb the water meter. Hunza Living Energy Water Systems attach to the outside pipe of your water supply, and users attribute remarkable results to its use, including delicious, energized water that is alive with energy and free of odor and chlorine - results that are guaranteed by the manufacturer. With a Hunza Water System your water will taste, smell, feel and be so much better for you and for your plants and animals. The small Golden Hunza is used for apartments, units, smaller houses, stock watering systems, and household gardens. As water supplies become more highly saturated with dissolved minerals (mainly calcium salts), the ability of soaps and detergents to perform effectively diminishes. The mineral saturation of water demands the use of more and more detergent. It also lacks the ability to dissolve and carry away the dirt and soil for which detergents are used. The Hunza Living-Energy Water Systems solve this problem by the principle of "ionization" of water, and this evidently increases its ability to hold salts in solution. The water is able to effect the detergent action upon dirt and soil, using far smaller amounts of soap and detergent, and objectionable odors and tastes are diminished. Best of all, natural minerals remain for consumption for good health. The Hunza System is among the best products available from Purple Harmony Plates. The system was produced by the manufacturer from the outgrowth of 20 years testing and marketing products worldwide. By simply strapping one energy tube to your incoming water supply and placing the other on or next to your hot water system you can have delicious, chlorine-free water that contains the Life Force Energy. The unit will produce soft hot water for washing, showering and cooking. The manufacturer guarantees this device will produce chlorine-free, live-energy water that is beneficial to all life forms such as plants, agricultural products, animals, and humans. The Hunza system requires no chemicals, electricity, or maintenance costs. Installation requires only a few minutes to attach the unit to the incoming water pipe. (If you can't find the incoming water pipe you can attach the tube to the plumbing beneath your kitchen sink.) This device utilize a 4th dimensional energy that cannot be measured with any known instruments. The atoms of the unit have been altered. This alteration tunes the unit into a source of FREE energy and it continues to function indefinitely. Within one or two days, all water passing by the Ionizer becomes free of chlorine and a change in the structure of the water occurs. Each Ionizer is creating approximately a five foot field of energy in all directions from the unit. By osmosis, this higher energy alters the atoms of the metal pipe and water heater causing a structural change in the water. (The unit is not recommended for use on PVC pipe but only on steel or copper water pipes.) The alteration of the atoms of the pipe and water heater is how this product works. If a scientific fact is not understood, it is called a MIRACLE. This is not a miracle … as the manufacturer understands the scientific workings of this higher energy. All of their products utilize this free energy. As this device produces a field of energy in all directions (like a bubble of positive energy) the atoms in the metal water pipes and the hot water heater are altered. It was learned some years ago that after a period of time the unit could be removed and the plumbing would continue to ionize the water. The manufacturer has not evaluated this idea … but pass it on to you for your own evaluation. Also, the unit could be placed in one room of a house to raise the vibration of the entire room. The manufacturer's design and configurations determine the amount of material used in the tube. For experimenters, it might be interesting to remove the tube from the pipe (after 3 or 4 weeks) and place the tube into your refrigerator (lay it on any shelf). You might have to turn down your thermostat as all of your food might freeze. If so, readjust your thermostat (or remove the unit). This is how the Fridge Fresheners work … to make food last longer, to remove odors, and to reduce energy costs. ORDER YOUR HUNZA WATER CONDITIONER TODAY. THEY ARE SOLD WITH A 100 PERCENT GUARANTEE TO FUNCTION AS CLAIMED. WE DO NOT WANT A SINGLE DISSATISFIED CUSTOMER.